FOR IMMEDIATE RELEASE – Thursday, September 27, 2012 -Auburn, California- SunMaxx Solar’s outside sale’s representative, Nick Zebroff, successfully collaborated with Casey Clarke from NuSolar Technologies (certified SunMaxx dealer) at the Gold Country Fair in Auburn, California from September 6-9, 2012. 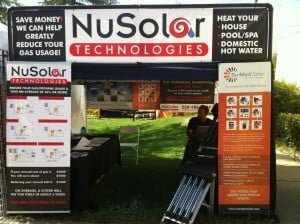 Throughout the four day event, over 100 residential patrons visited the SunMaxx/NuSolar booth curious as to how SunMaxx can help them greatly reduce their gas usage. Since the show, Zebroff closed one pool heating system and is currently quoting 10 other potential customers interested in SunMaxx Solar’s DHW (Domestic Hot Water), pool heating, spa heating, and radiant floor heating systems. With the success of SunMaxx Solar’s booth during the fair, a lunch-and-learn meeting has been set up with NTD Architecture based in Auburn, CA. NTD Architecture is highly enthusiastic about using SunMaxx Solar’s technology as a spec for future green designs.